Welcome to Part 4 of the Stuff It Stocking knit along. You can revisit Part 1, Part 2 and Part 3 if you need. We're on the home stretch and today we're going to decrease this stocking right off the needles! 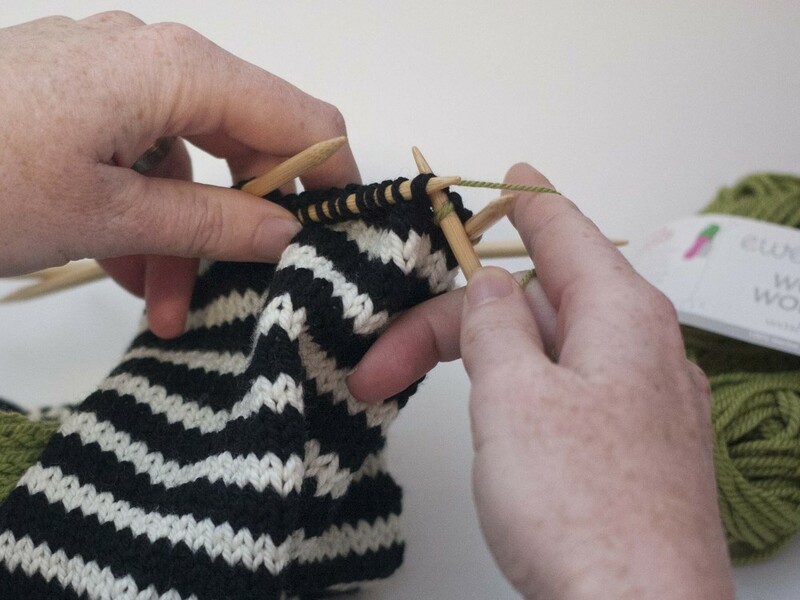 We'll be working the toe and finishing with the Kitchener Stitch. Cut Colors B and C. Change to Color A and knit to the last 3 stitches on Needle 1, knit 2 together then knit 1. Work Needle 2 as knit 1, SSK, knit to the end of the needle. Needle 3 knits as for Needle 1 with: knit to the last 3 stitches, knit 2 together, knit 1. And Needle 4 knits as for Needle 2: knit 1, SSK, knit to the end of the needle. You have completed Round 1 and decreased 4 stitches. Now knit the next round. Round 1: K to the last 3 sts on needle 1, K2tog, K1; needle 2, K1, SSK, K to end; needle 3, K to the last 3 sts, K2tog, K1; needle 4, K 1, SSK, K to end. Repeat these two rounds until 28 sts remain. Once you are down to 28 stitches (you should have 7 stitches on each needle) repeat only Round 1 until 8 sts remain. You will now have 2 stitches on each needle. Knit across the two stitches on Needle 1. Redistribute the stitches from Needles 1 & 4 on to one needle and Needles 2 & 3 on another needle. Hold them parallel. Cut the yarn leaving an 18" tail. Flip the stocking over so the yarn is coming from the back needle. Thread a yarn needle with the tail. We are now ready to begin the Kitchener Stitch. Step 1: Insert the needle into the first stitch on the front needle as if to PURL. Gently pull the yarn through the stitch leaving the stitch on the front needle. 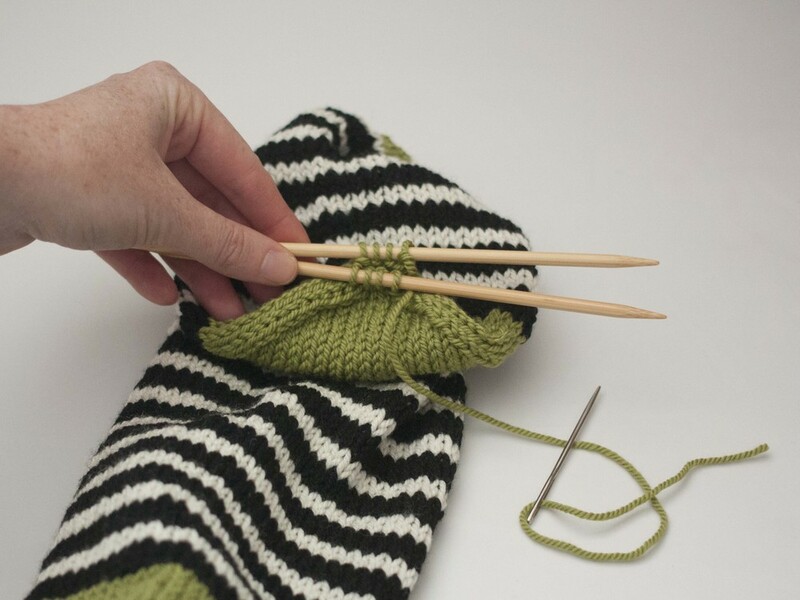 Step 2: Insert the needle into the first stitch on the back needle as if to KNIT. Gently pull the yarn through the stitch leaving the stitch on the back needle. Step 3: Insert the needle into the first stitch on the front needle as if to PURL. Gently pull the yarn through the stitch and off the front needle. Step 4: Insert the needle through the first stitch on the front needle as if to PURL. Gently pull the yarn through the stitch leaving it on the front needle. Step 5: Insert the needle into the first stitch on the back needle as if to PURL. Gently pull the yarn through the stitch and off the front needle. 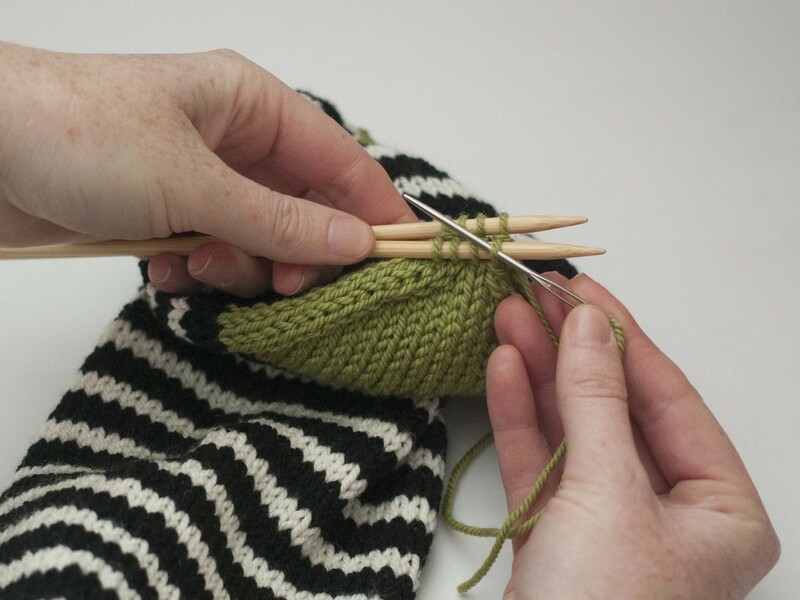 Step 6: Insert the needle into the first stitch on the back needle as if to KNIT. Gently pull the yarn through the stitch leaving it on the back needle. Repeat Steps 3-6 until all the stitches have been worked. If you don't get it on the first try that's ok! Working the Kitchener Stitch takes practice and time. It's a strange technique to graft live stitches together with a yarn needle. Just remember not to pull the stitches to tight with every step. 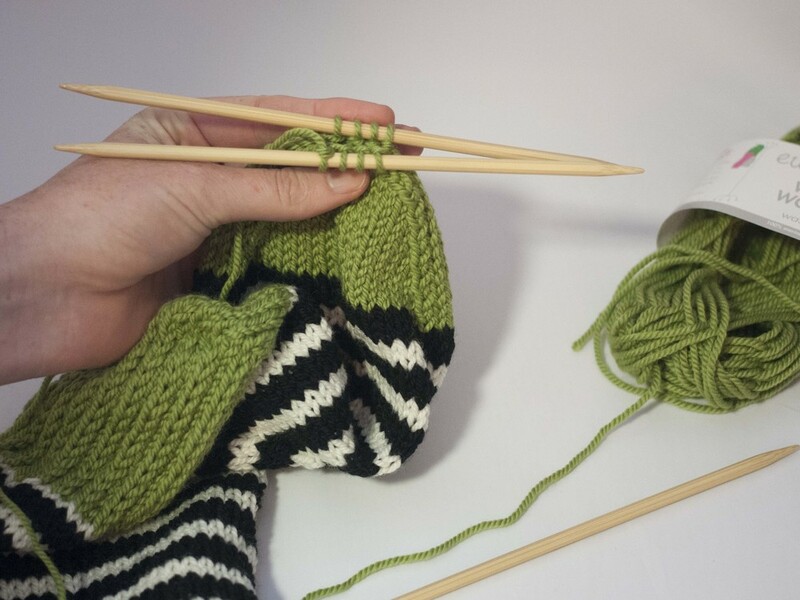 Remember you're adding a new row of knitting not making a seam. Secure your last stitch and weave in your yarn end. You just knit a whole sock! 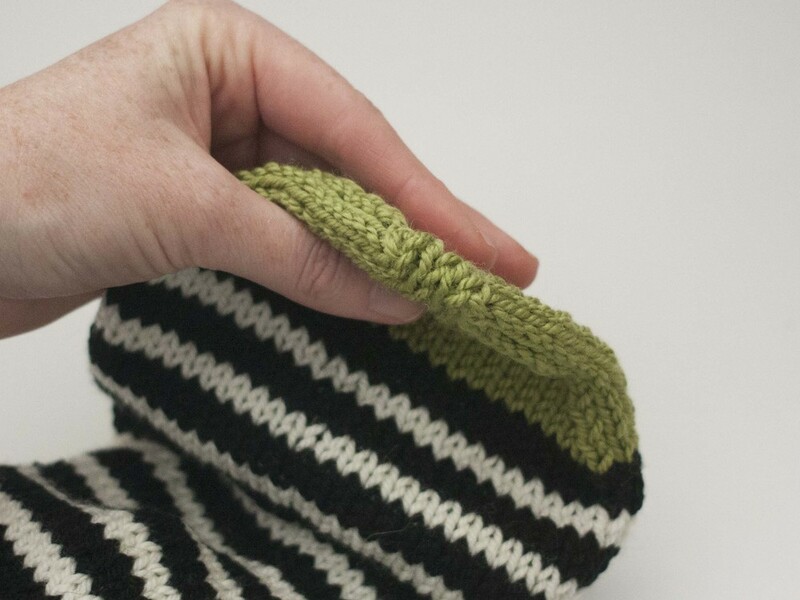 We have one last lesson where we'll make the hang loop and block the finished stocking. Come back on Tuesday, December 17 for Part 5.